What’s the most iconic off-roader of all time? Two names come to mind immediately – Land Rover and Land Cruiser. The former was best embodied in the Defender, which went out of production in 2016 after decades – and had morphed largely into a pricey and fashionable status symbol. But the Defender had a loyal following among those who used it for its intended purpose – off-roading, load-lugging and general dirty work. It’s to these people that the new Toyota Land Cruiser Utility should appeal – people who don’t care about fashion, but really need a car to perform flawlessly in the rough stuff for years at a time. Utility trim is new for 2018 and all about ‘less is more’ – even more so in the Commercial variant we tested, which ditches the rear seats and blanks out the rear windows to create a makeshift van. That means all the lipstick that’s applied to higher-end Land Cruisers has been vanquished – the Utility unashamedly sticks with black plastic for the grille, door handles and mirrors, features unadorned steel wheels and has a fantastically basic interior. 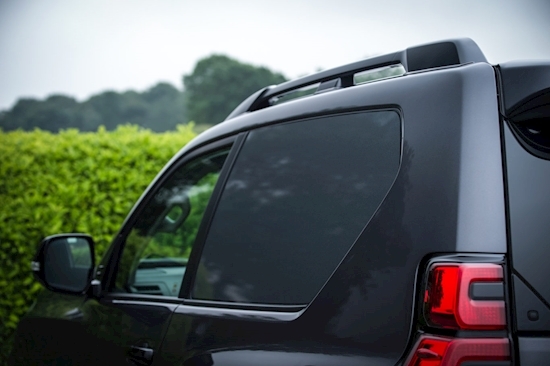 Utility trim can be had in three and five-door Land Cruisers, and with or without rear seats. Elsewhere, though, it’s business as usual. 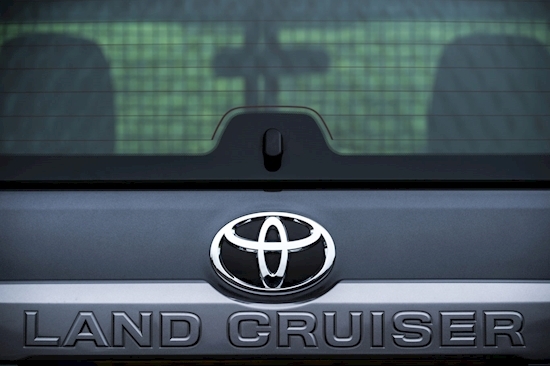 All Land Cruisers feature the same brawny 2.8-litre four-cylinder diesel engine under the bonnet. With 174bhp on tap, it’s hardly a sports SUV – but what it does have is torque, and plenty of it. With 450Nm at its disposal, it’s not sluggish, and it feels well suited. In this respect, the Utility Commercial model could be considered something of a ‘Superleggera’. Our test model also had something of a novelty – a six-speed manual gearbox. With most large SUVs turning to automatics, the manual is a charming anachronism, but it’s actually really pleasant to use. Despite the long throw, it’s quite precise, and it’s fairly easy to keep the engine in its admittedly narrow power band. Fuel consumption isn’t great – this is a very heavy car with the aerodynamic properties of a block of flats — but with an easy 35mpg within reach on a cruise, it’s certainly no worse than the Land Rover Defender ever was. The Utility holds a curious appeal for a certain type of driver, who’ll find its roly-poly handling characteristics, light steering, manual ‘box and sheer heft a great deal of fun. For everyone else, it’s inoffensive yet a bit rubbish on the tarmac – and near-unbeatable off it. The separate chassis construction means the Land Cruiser shakes and shimmies on rough surfaces, but this is dampened somewhat by the tyres. Using dinky steel wheels and fat rubber means smaller imperfections are fairly well cancelled out. 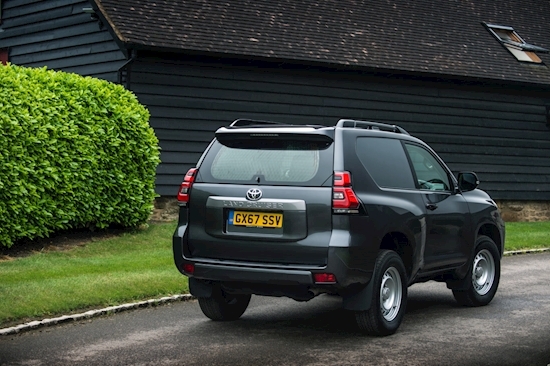 These tyres don’t help the handling, though – push it too hard through a corner and you’ll feel the Land Cruiser’s weight pushing at the limits of the sidewall. But this isn’t how most buyers will drive the Land Cruiser and where it counts is the rough stuff. Luckily, with a legendary all-wheel drive system, selectable low-range gearbox and enough ground clearance to drive over a pheasant without hitting it (we found this out first-hand (not on purpose)) it’s got the chops to handle many a rutted farm track with no grumbling whatsoever. We’ll admit a bias at the outset and say we love the Land Cruiser Utility’s looks – especially in this gawky, terribly-proportioned three-door short-wheelbase form. The curiously truncated appearance of this model aside, the sheer simplicity that Utility trim brings is actually very appealing, and you certainly won’t worry about leaving this in a crowded car park. 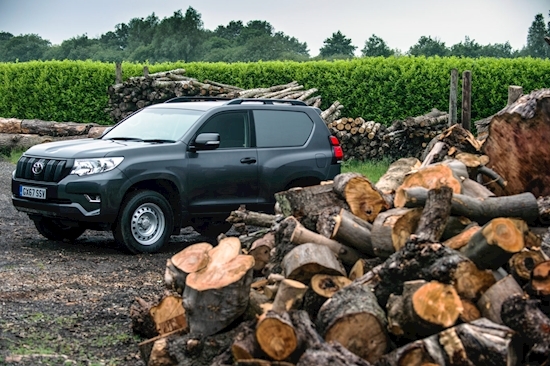 Everything on the outside – from the tiny steel wheels to the black plastic grille – has been chosen for ruggedness and durability, and the Land Cruiser wears the look well. Far more convincingly in fact than it does the chintz of higher trim levels. Our Commercial model saw the rear seats ditched for a steel mesh bulkhead and large, flat load area. This is no van, though, with the space on offer more akin to a compact estate car than a Ford Transit Custom or similar. It also suffers with a vast, side-hinged rear door – far from practical – and no interior coverings to the blanked-out rear glass. It’s practical if you need to make deliveries off the beaten track, but almost any compact van will outdo the Commercial on load-lugging – though most of them can’t handle a three-ton trailer like the Toyota. Up front is where the charm of Utility models shows through once again. Who needs leather seats? The Land Cruiser offers the finest in Japanese velour, and as sarcastic as that sounds, it’s fantastic.- warm, comfortable, and grippy. There’s plenty of room for two up front, and unlike a Defender, the driving position is both comfortable and adjustable. The broad-shouldered won’t need to drive with the window down, for example, as they did in Land Rovers, and there’s even space behind the seats for a few bags if you don’t want them sliding around in the rear load area. There’s not much equipment on offer, but you do get keyless entry and start, air-conditioning and Bluetooth operation for the stereo. The only thing we found ourselves missing was a DAB radio. Even more happily, the Utility model’s options list consists of just one item, which is a towbar and towing preparation package. Sure, you could opt for a plusher model – but ask yourself, do you need to? The payoff for this lack of equipment is a price that could reasonably be called a bargain, too. Our model weighed in at £32,995, though running costs – tax and insurance – will be high. The Toyota Land Cruiser Utility showed an unnatural ability to worm its way into our hearts during our time with it – perhaps this is the same magic that kept motorists buying the cramped, slow, inefficient and unsafe Land Rover Defender for so many years. There’s no doubting that the Land Cruiser is every bit as capable as that car, and while it’s miles off the pace for on-road dynamics compared with the majority of crossovers, entrenched loyalists won’t care.